Ideation is a huge part of what I do and who I am as an individual. My job requires me to be innovative and creative on behalf of my clients and agency, and my inner muse demands the same things from me at home. However, an important part of that innovation/creation process is the realization that not every idea will be perfect, and that that’s okay. If I’m being honest with myself, as someone who has a tendency to be a little OCD, it never feels okay, which means it’s a concept I’m going to have to work to apply. Be self aware and actively listen. 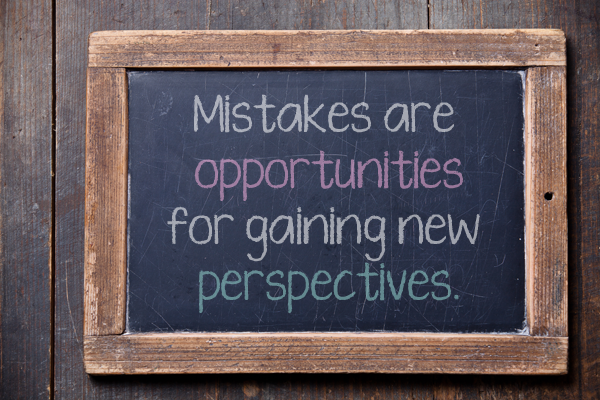 Mistakes are opportunities for gaining new perspectives. I work in a lot of collaborative environments: at the office, at home and with organizations I volunteer for, and this philosophy of seeing mistakes as gifts, and not being afraid to fail, is a challenge I hope to apply in the days, weeks and months ahead to take my creativity and ideas to the next level.